The assault on the Gallipoli Peninsula was designed to engage Turkish forces by land and eventually push through to the Turkish capital Istanbul. Turkey had entered the war on the side of the Triple Alliance. An attempt by the Allied forces (including the Australian submarine AE2) to sail past the peninsula through the Dardanelles had been repulsed by mines and Turkish guns. Failing to sail past the peninsula, an infantry attack was planned instead. But the Turkish forces were also well-prepared on the land. Under German leadership, Turkish troops had used the natural landscape - sharp ridges and gullies- and the cover of scrub to set up strong positions. They established firing lines from reinforced positions that towered over the Turkish beaches. The Australians and New Zealanders only represented a small part of the force that assaulted Gallipoli; British, French, Canadian and Indian troops also took part in the campaign. 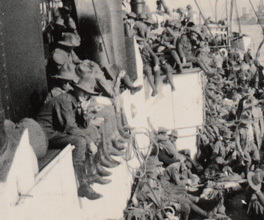 A miscalculation saw Australian troops disembark further north than intended but the forces from other nations also suffered heavy losses in their landings. Many Australians were shot in the landing. Some were wounded and then drowned under the weight of their equipment. Others managed to reach positions at the foothills of the beach and scrambled up the hills taking out Turkish positions and establishing their own trenches. Arrived at firing line at 10 o'clock this morning having a very bad time of it so far machine gun played hell on our men for a start they were getting killed all around me but escaped so far. Thinking a lot of wife and child. Love was killed that day. Of the 60,000 Australians that fought at Gallipoli, there were 26,000 casualties and 7,594 were killed. Later battles like the one at Lone Pine would see the Australians suffer, but also inflict, terrible casualties on the Turkish troops: by the end of the campaign their dead would number more than 85,000. We all growl and swear at the work and the war in general and all reckon we were D----- fools to have ever come to the war, but don’t think one of us would have missed it for anything. The Gallipoli Peninsula was an awful place, and we are all glad to get away from it, but we are all pleased that we saw it. It seems a pity that so many lives should have been lost there and then have to give it up, but I suppose it was the best thing to do. One of the 'positives' the Allies would claim from Gallipoli was the retreat. Called a success for evacuating so many men with so few casualties, it has traditionally been seen as a triumph of organisation and ingenuity. To carry off the retreat without alerting the Turkish forces, the Australians reduced troop numbers to a bare minimum and made timed devices like the drip rifle. The Australians wanted to give the Turkish the impression that the Allied trenches were still occupied so that they would not be attacked while their numbers fell. In reality, many historians now think the Turkish had little reason to pursue an evacuating enemy and incur further losses. In this way, even with 100,000 men killed, the events at Gallipoli were revised by both sides for the purposes of propaganda. Separated by 20,000 kilometres, Australians at home were encouraged to support the troops in any way they could. As Australian armed forces grew from 3,000 to 50,000, some soldiers struggled with the discipline of military life.